← Honah Lee and Plurals Fall Tour Dates! 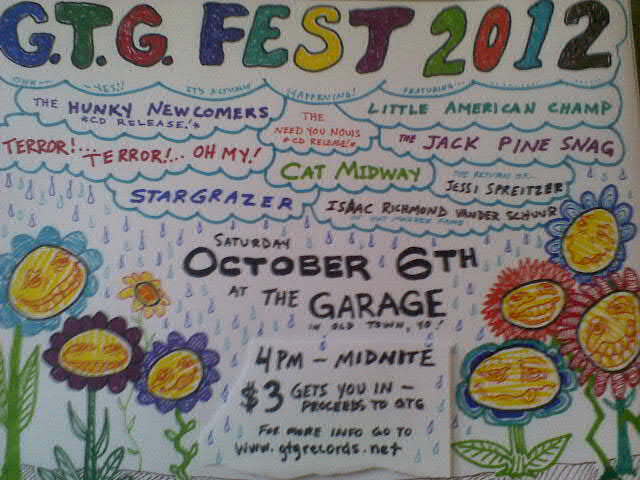 GTG Fest is coming back! This Saturday, October 6th, 2012 in Old Town in Lansing. Bands, beers, people (both awesome and, eh) will abound and the proceeds go to help GTG Records get some of these sweet records out that we have in our queue. We’re holding this year’s edition at the Garage (310 North St) that we’ve been doing the occasional show at this year. $3 cover for a full day of music; admission also includes a cup for delicious craft beer provided by our friends at Mash Pit Brewing (21+, don’t be stupid). Doors open at 4 PM. Burgers – meat and veggie – will also be available from 7:00-8:00. We have a really cool lineup together, featuring lots of friends, including GTGers The Hunky Newcomers, Stargrazer, Isaac Vander Schuur (the Hat Madder), Need You Nows (members of Frank and Earnest and The Plurals playing stupid pop punk, also releasing their first CD), and our old friend Jessi Spreitzer returning to the stage. Cavalcade, Little American Champ, The Jackpine Snag, Terror Terror Oh My!, Cat Midway, and Dead Ben Rooster round out the bill. Parking is available along Turner St, at the parking lot for Mobile Health (1515 Center Street – NO OVERNIGHT PARKING), and behind the garage at the lot on the corner of Turner St and Beaver St. Please do not park next to the house on the corner of Turner and North, the people have been very cool with our shows and we want to keep it that way. 8:00-8:30 PM – Terror Terror Oh My! The fun doesn’t stop there! In the days following GTG Fest, Frank and Earnest are playing at Mac’s Bar with Mustard Plug on October 7th, and The Plurals and Honah Lee are co-headlining a shindig at Mac’s on October 10th. Then, Lansing will pick itself up out of the haze of vomit and merch that they don’t remember buying. Cheers!